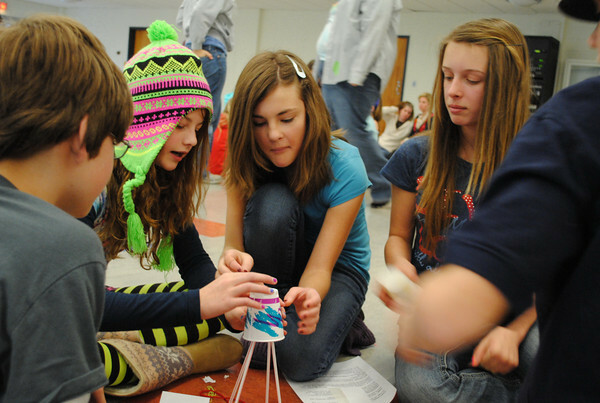 Each Destination Imagination Challenge is an exercise that socially and intellectually activates students by prompting them to use creativity and teamwork to solve a complex problem. Team Challenges are open-ended and multidisciplinary. Teams spend several months working on the solution to the Team Challenge of their choice. Teams present their solutions at Tournaments. Instant Challenges require teams to engage in quick critical thinking. At every Tournament, each team will receive an Instant Challenge and the materials with which to solve it. The participants must think on their feet by applying appropriate skills to produce a solution, with only five to seven minutes in which to work on an Instant Challenge that they have not seen before. Instant Challenges are performance-based, task-based, or a combination of the two. Although each Instant Challenge has different requirements, all Instant Challenges reward teams for their teamwork and the creativity of their solutions. Instant Challenges require teams to engage in quick, creative, and critical thinking. At a tournament, a team will receive an Instant Challenge and the materials with which to solve it. The team members must think on their feet by applying appropriate skills to produce a solution in a period of just five to eight minutes. Instant Challenges are performance-based, task-based, or a combination of the two. Although each Instant Challenge has different requirements, all Instant Challenges reward teams for their teamwork. Instant Challenges are kept confidential until the end of each DI season in May. Design and build an invention. Create and present a story about how a problem is solved with the use of the invention. Integrate an invention artifact to highlight the development process. Design and build scenery that shows the impact of solving the problem. Research a real species and a real habitat. Create and present a story about the first encounter between the species and the habitat. Show how the species and the habitat change as a result of the encounter. Present the story in theater in the round. Design and build a bridge that will be assembled during the Presentation. Move weight across the bridge to test its strength. Create and present a story about an unexpected connection and its outcome. Design and create a set piece that transitions between settings. Create and present two Team Choice Elements that show off your team’s interests, skills, areas of strength, and talents. Theatrically recreate the photograph during the Presentation. Create and present a visual effect that includes a photographic technique. Show how the visual effect changes the perspective of one or more characters. Create and present two Team Choice Elements that show off the team’s interests, skills, areas. Research superpowers and how they are portrayed in comic books, literature, film, and other media. Create and present an improvisational skit about a villain who uses a superpower to cause an unexpected situation. Include a hero who uses an underwhelming power to try to overcome the unexpected situation. Enhance the skit with sounds effects. Create and present a story that shows at least one character in a race against time. Integrate information about the project into the story. Design and build a device that represents time and highlights milestones from the project. Rising Stars! Challenge: Blast Off! Create and present a play about characters who travel from one planet to another. Include something surprising that happens during the trip. Design and create a puppet to use in the play. Launch team-created rockets during the play. Create costumes, props, and scenery to help tell the story.